The experience of hiking the Pacific Crest Trail is an ever-changing one and the last five days (86 miles) feel like a new chapter. Lisa and I have fallen out of sync with most of the familiar hiker faces while also pushing ourselves to walk longer and greater distances. I’m shedding weight faster than Jeb Bush while Lisa, who has no excess weight to lose, is succumbing to hiker hunger and slyly petitioning for restaurant stops at every opportunity. We’ve also encountered some extreme terrain and weather, not to mention a reptile or two, that I’d love to tell you about. 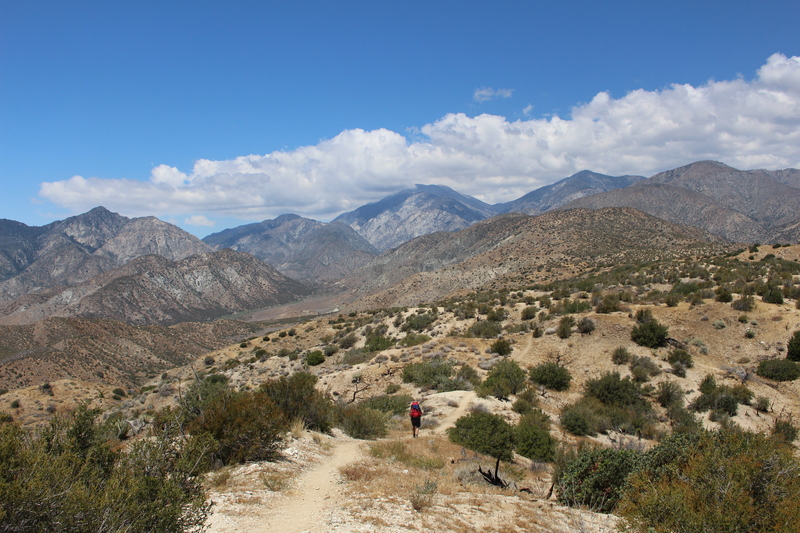 We tried to wait out some bad weather in Idyllwild so we could take an alternate trail to the San Jacinto Peak. When the cold and the clouds did not abate we took a shuttle from the hotel with Bushwhacked and a young hiker from Florida (trail name: Apache) to the head of the Devil’s Slide Trail. As we started up the steep set of switchbacks zigzagging up the side of the mountain, a cold mist buffeted our rain gear and numbed our hands. Bushwhacked, usually the fastest hiker in our cohort, never passed us. We suspect he had his fill of the weather and went back to town. Lisa and I kept pace with Apache, climbing into the clouds and joking about the marvelous views hidden in the clouds all around us. The higher we climbed, the stronger the wind and the deeper the cold. We climbed to an elevation of over 9,000 feet. Higher, actually, as Lisa and I took a wrong turn and took the ascent trail toward the top of the mountain for half a mile before checking our GPS and realizing our mistake. 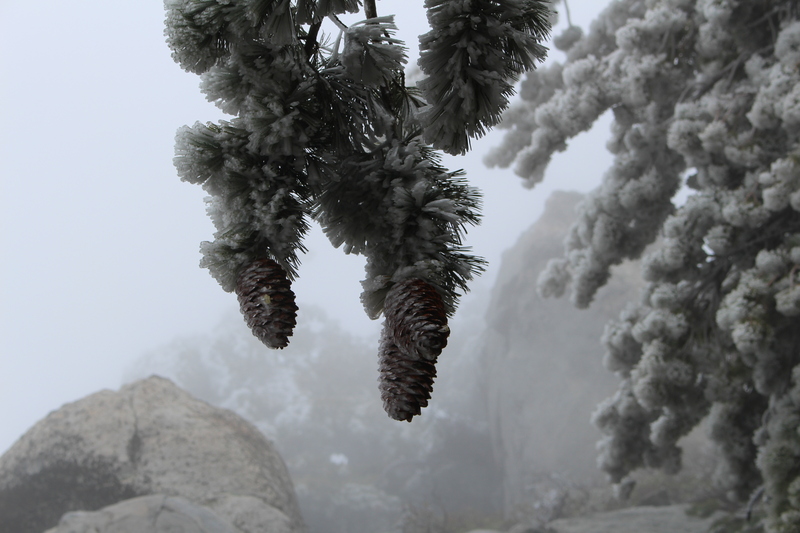 When we rejoined the PCT and began our descent from Mount San Jacinto into the San Gorgonio Pass, the pine trees around us were coated in ice and patches of snow covered the ground. The wind in the pass was fiercer than on the other side of mountain so that descending to lower altitudes with their higher temperatures were counteracted by increased wind chill. After covering sixteen frosty miles, Lisa and I made camp in the first little nook that offered respite from the wind. It was a good thing we had picked up our winter sleeping bags in Idyllwild the day before. The next day was sunny and warm although the winds cutting through the pass were just as strong. In better spirits, Lisa and I hiked like happy mountain goats down from the San Jacinto mountains, dropping 8,000 feet to the desert. 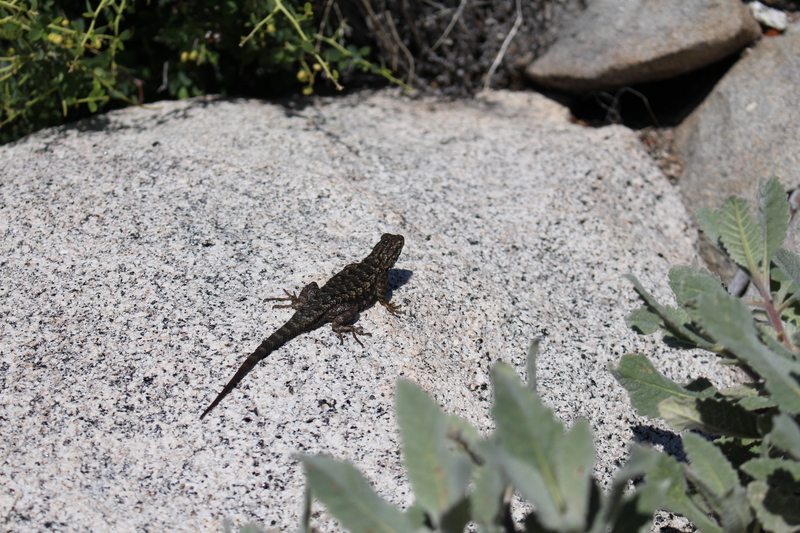 At about six or five-thousand feet of elevation, the trees gave way to boulders and scrub oak and chaparral, and lizards! 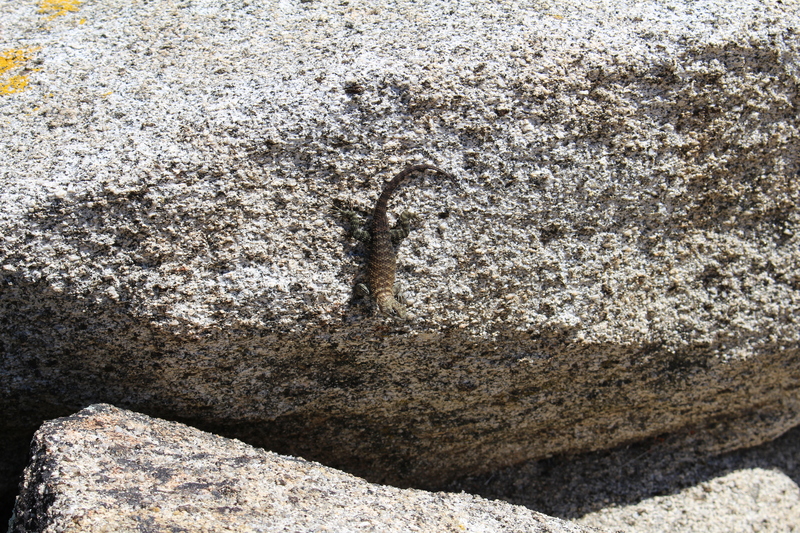 Seriously, the mountain side was saturated with the scaly creatures. Big ones, littles ones, brown, black, blue and gold. Every few feet, one would flit across the trail or scramble gracelessly over a rock and leap into a bush. It was like reverse Godzilla, where a giant, misunderstood, pasty creature tromps across the landscape, sending the terrified denizens scattering. 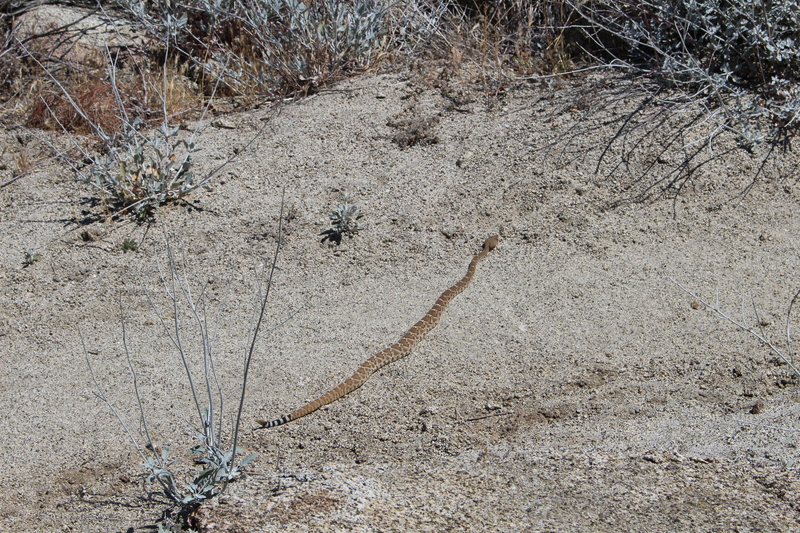 The rattlesnake, however, was less timid. About three foot long, a reddish hue, the serpent was stretched across the trail when we rounded a bend. It rattled its tail ever so slightly but otherwise did not seem particularly distressed. Lisa took some photos from a respectful distance then the two of us bushwhacked a wide path around the creature. 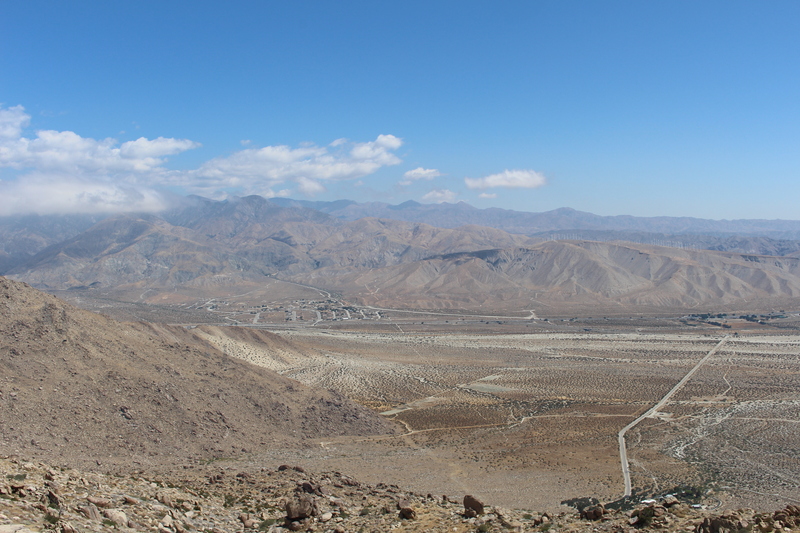 San Gorgonio Pass was a drab barren plain, bristling with wind turbines, through which Interstate 10 (or THE Interstate 10 as they like to say here) cuts across toward Los Angeles to the west and sandy oblivion to the east. 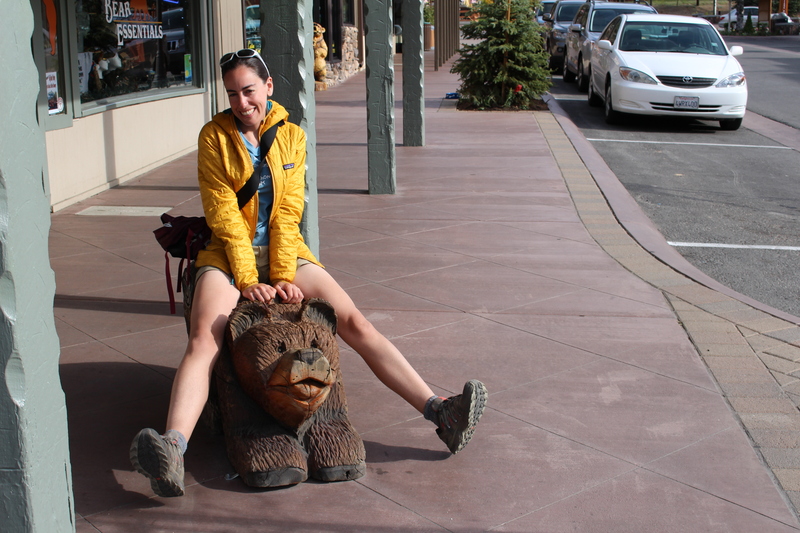 In the middle of the pass is a small town in which live the venerated PCT trail angels, Ziggy and the Bear. This tremendously generous couple, with the aid of their grandson, have greeted thousands of hikers over the years, offering them a place to stay in their carpeted backyard, the use of the bank of porta potties set up in front of their house, showers, an outdoor sink for dishes and laundry, and modestly priced sodas and candy. They also will hold resupply packages for a small fee. Lisa and I stopped in and met the delightful Bear, picked up our package and bought a couple Dr. Peppers. We signed in and were designated hikers #1383 and #1384. 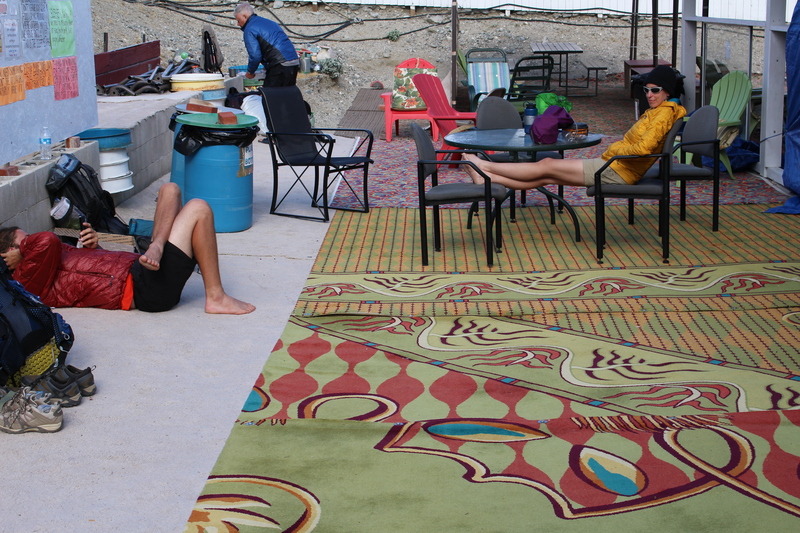 We rested for a while on the bright clean carpets spread across our hosts’ backyard oasis but did not stay the night. By the end of the day, Lisa and I had hiked our first 20+ miler on the PCT. The next two days we kept up the pace by completing 18.7 and 21 miles respectively. 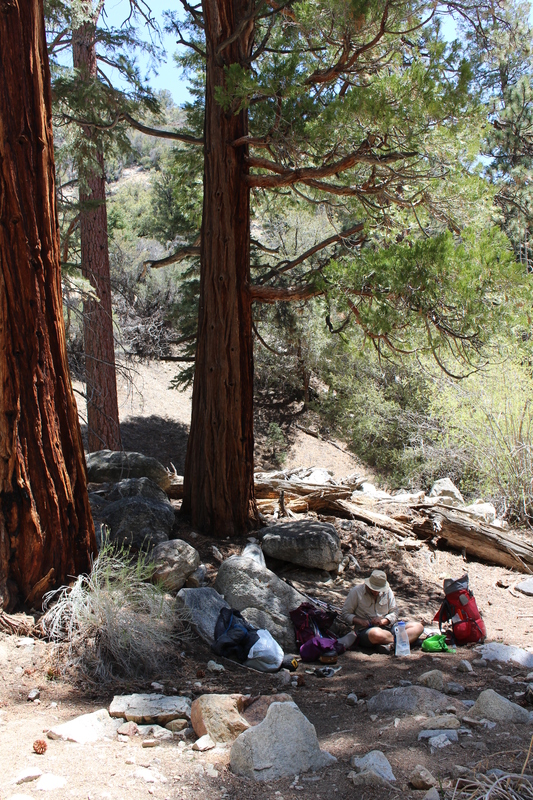 We covered the San Gorgonio Wilderness, a hot stretch of winding canyons and creek beds then ascended into the San Bernardino Forest. The unrelenting sun blasting down upon me proved mentally and physically taxing. While Lisa abhors the cold, I prove equally adverse to the desert sun. 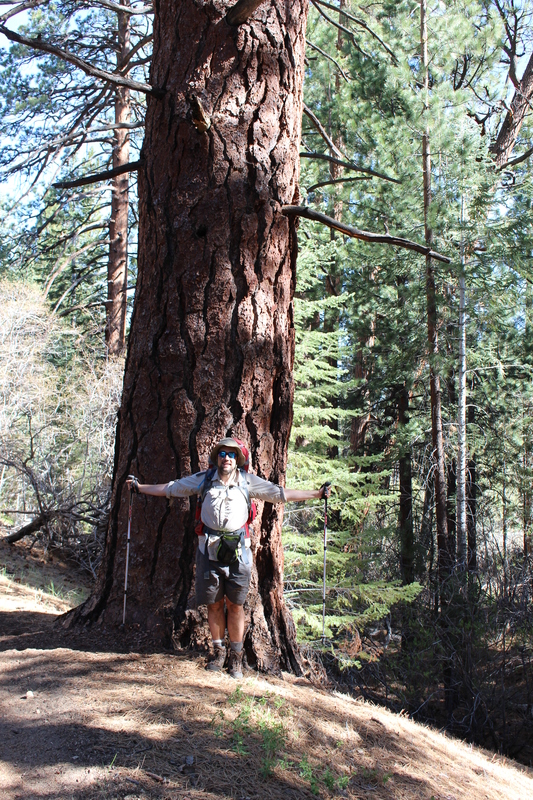 I felt a profound sense of relief while hiking through the shade of the sequoia and redwood trees of the upper elevations. One minor hitch to the trees, however. Pinecones! Tribbles of the forest, as I call them. Yeah, they’re cute at first, but they quickly multiply and clog the trail, getting underfoot, making you feel guilty every time your heel crunches down upon them, or eliciting a rage when they roll your ankle. I don’t care how pretty they are… enough tree spawn is enough. All worship the shade of the trees! A much needed lunch break in the shade. I realize this post has taken on a rambling tone, so I will end it with Lisa’s face to face encounter with another rattlesnake, larger and more ornery than the first. 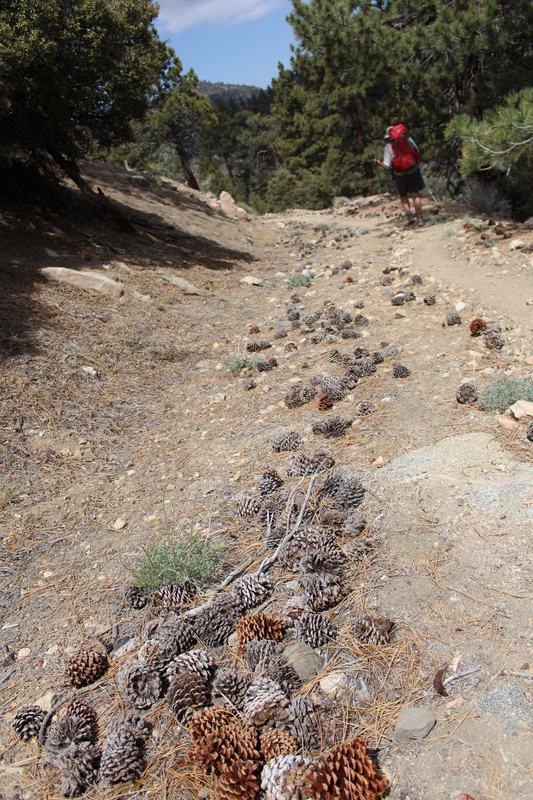 I missed the fun at first, as Lisa was just ahead as we made our way up the PCT. It was only when she leapt back, waving her trekking poles through the air, calling out a sort of “wha-oohh.” Just as surprised was the black rattlesnake just a few feet ahead, bunched up with its rattle quivering high over its wide, arrow-shaped head. Lisa quickly recovered herself and took out her camera, although I urged her to step back even further. Sadly, no clear pictures were taken. The obsidian-hued snake was having none of it. It continued to shake its angry tail while tensing its body. Like reprimanded children, Lisa and I backed down the trail a bit, and the snake slithered to side, then for good measure wound itself back up and issued renewed promises of destruction with its tail. Lisa and I promised with our silence to be good and the snake stretched itself out and made a cautious exit into some ground cover. Objectively, the snake looked to be about forty inches long although my terror gaze knows the beast was probably five feet in length at the least. We’re now taking another zero in Big Bear Lake, a large tourist town with all the amenities of Julian and Idyllwild combined, but far less charm. That’s okay. Lisa is eating everything in sight and I’m consuming so much Dr. Pepper that I’m thinking of saving time with a corn syrup IV. I probably won’t as that might be a challenge to hike with on the trail. Playing tourists in Big Bear Lake. I’d have left the trail a the first rattlesnake sighting at full run! Bravo to you both for your perseverance! Miss you. Wow! So happy those snakes left you alone and you have them a wide berth. Maybe in the next chapter of your life, you guys will become Trail Angels along the PCT! Not a bad gig paying it forward every day. Best wishes for the next chunk of trail! Love you guys! WOW! So many perils on the PCT. You guys look great…don’t even look sunburned. It is amazing how well you are doing considering the weather, rattlesnakes and lack of oxygen. BRAVO! I’m sending another package tomorrow to Lancaster ( Mile 517). Keep on trucking!